DCS System Architecture – The building block concept of electronic control design, with distributed proc­ess controlled boxes linked together by a communication network, was first introduced by Honeywell in 1975. Today, the monitor and control boxes connected to the Data Hiway as shown in Fig. 21.77 are an integral part of the TDC 3000. 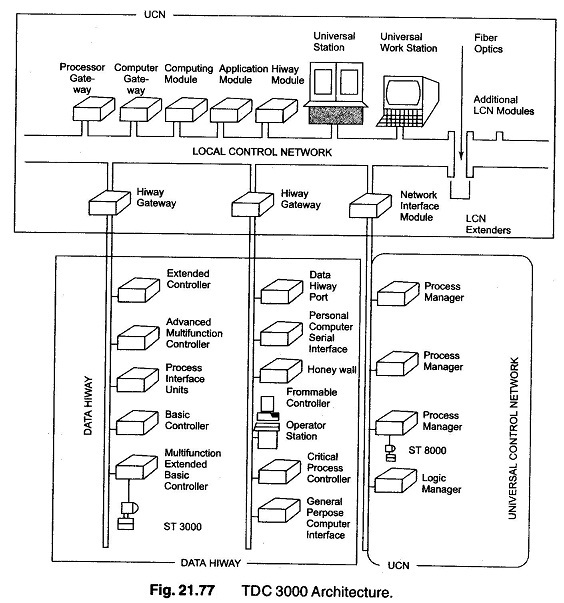 By incorporating a high speed proprietary LAN called the local control network (LCN) with associated modules that accomplish specific functions, TDC 3000 offers a product that is compatible with systems already in the fields, is fully integrated and at the same time, has flexibility to continue to change and to grow along with the processes it controls. The user need purchase only those modules required to meet plant control objectives at the time, with the assurance that increased capacity and/or functionality can be achieved later by adding the additional module as required. A bit serial communication path that operates at 5 Mega bits. It provides communication links between all nodes of TDC 3000. A redundant pair of 75 ohms co-axial cables connected to each node. Each coaxial segment may be up to 300 m long which may be extended up to 2000 m with optic fiber cables to a remote universal station or another coaxial segment. It connects to up to 64 nodes. After 40 nodes it requires LCN extender. It may also be extended to up to 96 nodes as a special option. PIU are used when a large number of process variable need to be monitroed or fed to a higher level module. They are available in low level (LLPIU), high level (HLPIU) and low energy (LEPIU) version. The levels refer to the amplitude of the signals with which the PIUs interface. The low energy PIU is configured with multiplexer boxes that can be distributed in the plant. The various controllers used in DCS (TDS3000) is listed below along with their features. Basic Controller (CB) This controller handles only continuous Input/ Output (I/O) operations. It can accommodate input/output for eight control loops, plus eight additional monitor-only inputs. Extended Controller (EC) EC is used to handle continuous Input/ Output and logical operations. It provides sixteen control outputs, eight outputs, sixteen digital outputs and sixteen digital inputs. Multifunction Controller (MC) MC controller used in DCS System Architecture, handles continuos I/O operations, logical operations and sequential control for batch operations. Each MC has the capacity to control 16 analog loops and handling up to 30 analog inputs, up to 72 analog output, up to 256 digital inputs, up to 64 counter inputs. Advanced Multifunction Controller (AMC) AMC is the modification of MC and it has the same function as MC. It takes less space and the scanning is faster than MC. All of the above controller types can be equipped with a digital interface to Honeywell’s ST 300 smart transmitter, making it possible for the controllers to take advantage of the increased capabilities of this transmitter. The following are the additional boxes (units) provided in a DCS System Architecture. Data hiway port are interface between TDC3000 and non-Honeywell process connected boxes. The list of devices included in this box are analysers, tank gauging systems, machinery monitoring systems, emergency shutdowns systems, data acquisiton systems and compressor control systems. The critical process controller consists of a fault tolerant logic control system and also triple redundancy. This unit provides an interface to any personal or mini computer with an RS-232 serial port. Typically the PC scans selected box values which could be viewed or archived into the PC files for such applications as the data analysis, customed reports and special calculations. This section provides the interface between the TDC 3000 Data Hiway and any computer having general purpose I/O adapter. It has 16-bit parallel communication. This consists of a Logic Control system (LCS) and IPC620 line of programmable controllers. It can perform logic and interlock function. US is a Universal Window through which the operator monitors and controls the process and handles process and alarm systems. It stands on the LCN and communicates with all modules on the LCN, process connected devices on the Hiway via Hiway Gateway and UCN mode, via interface module. It provides comprehensive facilites to the process operator, process engineer and maintenance technician on the universal window. Display and print process history, process trends and process averages. Display and print journals, logs and reports. Monitor and change status of system equipment in the control room and in the field. Load other system modules with operating programs and databases from History Module, floppy diskette or cartridges. The process engineer do the following. Build system and process database, graphic displays and reports. Perpare edit and compile CL programs. Loading operating programs and database from or to history modules and floppy diskettes. Diagnose problem in any module in the system. Display and print troubleshooting information. This workstation is made available for process engineering and maintenance function and for monitoring by the process supervisor. It has the capability of virtually all the functions as the Universal Station but is designed for an office environment. History of process alarms, operator changes, operator messages. system status changes, system errors and system maintenance recommen­dations, also continuous process history to support logs and trends. Check point data for maintaining up to date box and module setting in the event the device is taken out of service. Global database can be assessed by any mode on the LCN. Storage of system software and application. This control consists of an application module or AM. It provides supervisory level control. It has access to broader scope of information. It can also access any process connected box in the system. It provides programming for custom algorithms through powerful process oriented lalnguage CL. It has an advanced control programs beyond capabilities of standards algorithms and control language (CL). It can perform simultaneous calculations such as multivariable process control. It has access to any process connected box. It provides an environment where the user can develop, debug and execute programs to perform such function as process optimization, advanced custom report generation, long term data storage, scheduling and plant management.